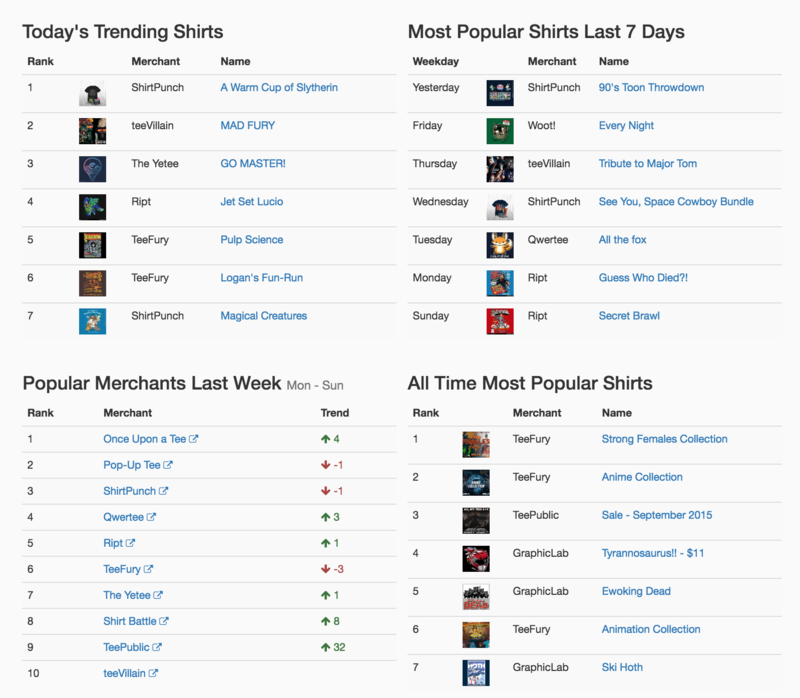 … and we did it: you can now sort the designs on the front page of Day of the Shirt by which t-shirt designs are trending right now. Today’s trending shirts: the same algorithm as used on our front page, this weights recent activity more heavily than older activity. We used a similar algorithm to Reddit. Popular merchants last week: Aggregating activity across a merchant, this ranks merchants by the popularity of their designs. The arrows next to it shows how the merchant moved up or down in the rankings versus the previous week. All time most popular shirts: These shirts are the all-time most popular designs and sales shared on Day of the Shirt. It’s been a lot of fun digging into the data and creating interesting analyses. If you have any feedback or ideas for further discovering great t-shirt sales, let us know! Email us at [email protected] or tweet us at @dayoftheshirt.